NASA does not currently have a roadmap for a trip to Mars. But that does not prevent the US space agency from preparing for this travel. NASA regularly conducts studies and develops concepts to try to solve the problems associated with maintaining human life on Mars. 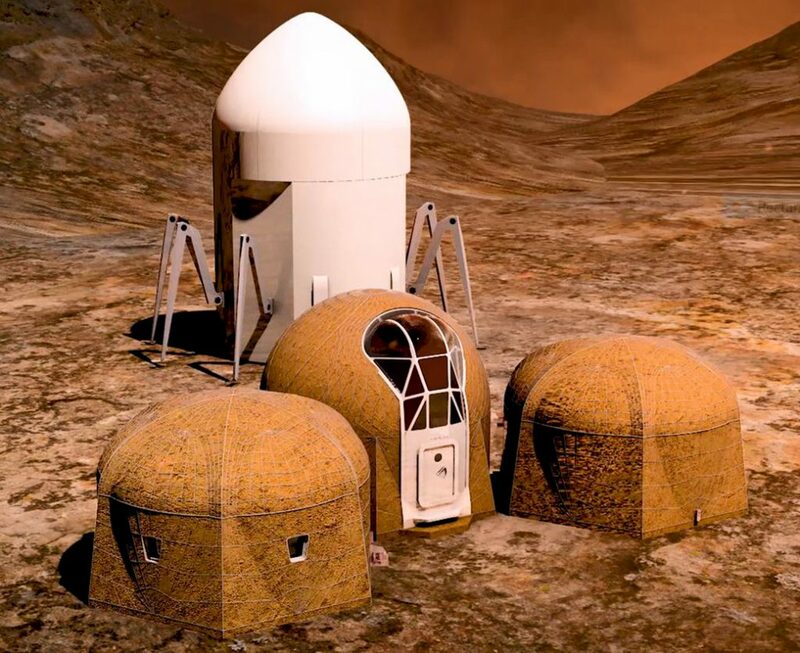 Among its latest initiatives, NASA has put several teams into competition to imagine the creation of a Martian habitat. 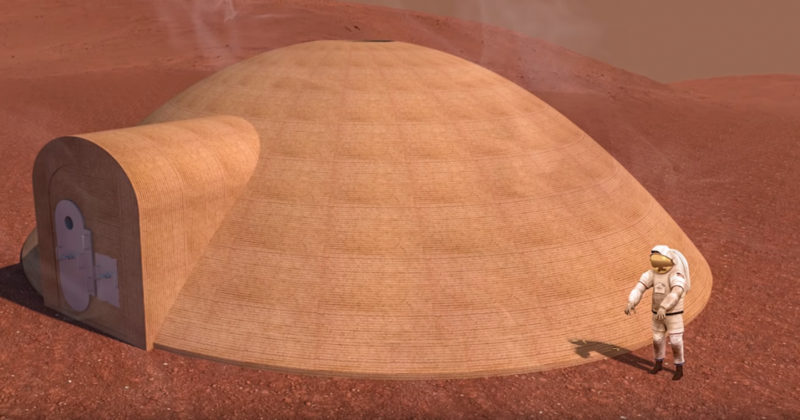 A Martian shelter suitable for men must have several qualities such as waterproofing, radiation protection and thermal insulation. 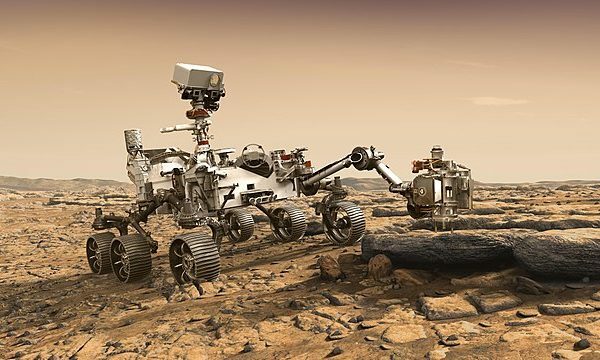 As part of this competition, the US Space Agency also asked participants to work from materials available on Mars. The competition started in 2014 with 18 teams and there are only 5 left today. The teams will have to pass five 3D modeling phases and three real construction phases. The teams are now in the middle of the third phase of building a model of their concept. The five teams devised very different solutions to develop their habitat on Mars. All of these teams produced multi-minute videos explaining their concept. The Zopherus team bets on a huge lander that is actually a construction plant that moves on the Martian soil using feet to find the perfect location. It then deploys rovers to get the necessary building materials. The plant then attaches to the ground and prints the structures in a pressurized environment. The result is a three-part easy-to-expand habitat. For the MARSHA team, the ideal solution is through a cylindrical habitat of great height. This shape also minimizes unnecessary spaces and can be printed by a robot with low mobility. The habitat imagined by the team has four floors each dedicated to different activities for explorers. The Kahn Yates team plans to print their habitat around their lander. The structure would take place at the equator and consists of two parts. An external dome is responsible for maintaining the pressure and the habitat is printed inside the dome. This configuration allows to leave some place for a useful and pleasant garden in the dome. The fourth SEArch+ team focused on a habitat that protects against radiation to a maximum. Two inflatable cylinders are partially buried and covered with a thick structure printed in 3D. The fifth team focused on an inflatable dome over which an extra layer of protection is printed in 3D. 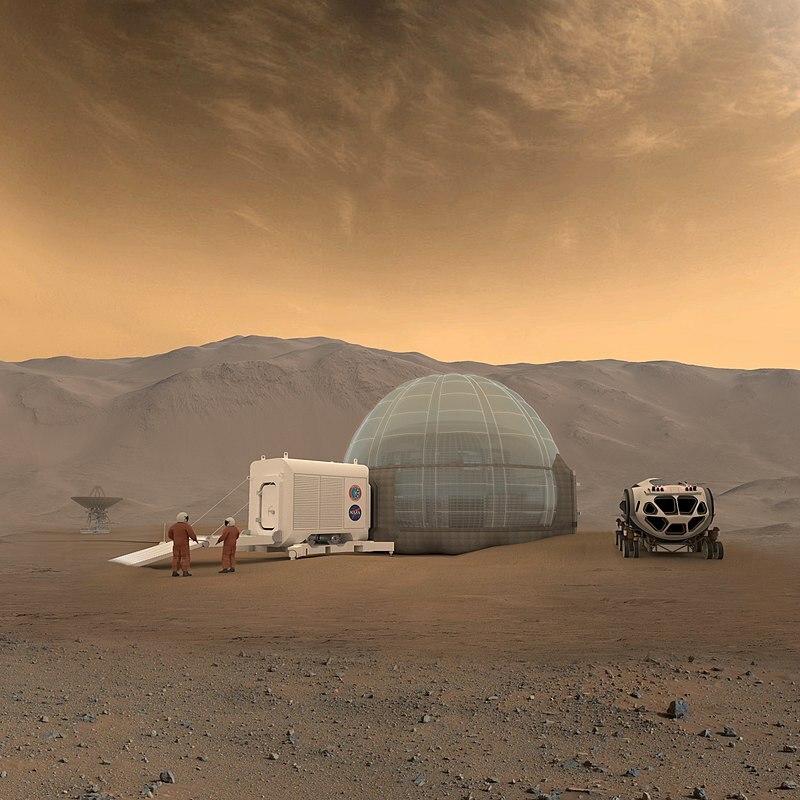 All these concepts are first and foremost dreams because we imagine that the first Martian habitats will not be as luxurious as those presented by these 5 teams. But we must still think about these issues if we want the trip to Mars to become a reality. 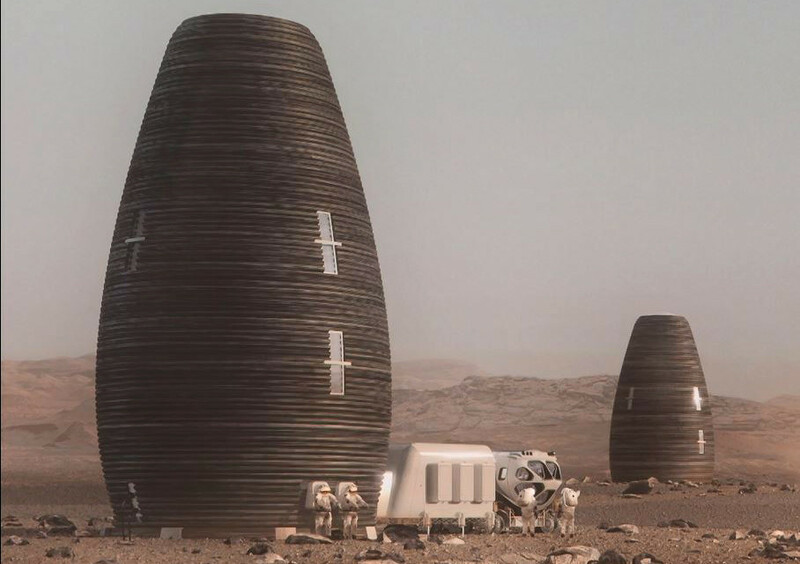 Perhaps one of these concepts will serve as a basis for the design of the first real human shelter on the red planet. Early in the history of spaceflight, Mars was the center of attention. As early as 1948 Wernher von Braun, one of the pioneers of modern astronautics, is thinking about a program of missions to the Red Planet. Even before the first space flight, his book Das MarsProjekt plans to send a team of 70 scientists in a fleet of ten spacecrafts. He calculates the possible trajectories and the different launch of the engines which would be necessary for this travel, according to the expeditions of Antarctic exploration of the time. Such a mission to Mars seems almost grotesque today because obviously Wernher von Braun could not anticipate that the huge progress of robotics would allow us to explore Mars at a lower cost. Today, we know much more about Mars, but the ambitious missions imagined by the German engineer have never seen the light of day. Yet the idea comes back regularly lately. 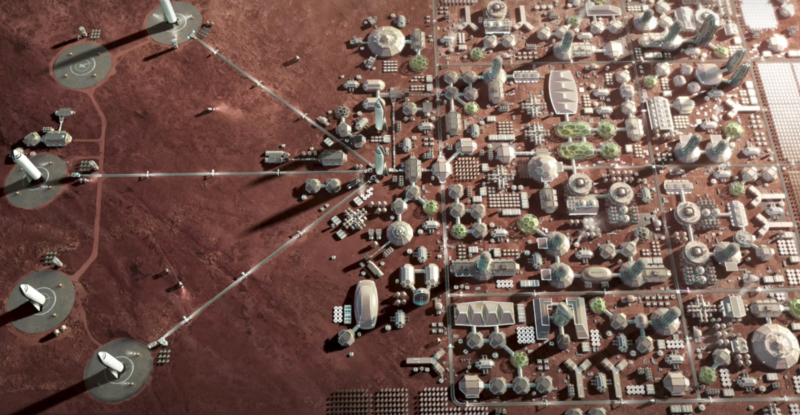 SpaceX, a private company, plans to make possible the Martian colonization. The manned trip to Mars is a very complex one. Even NASA does not seem to believe it. If humanity decides one day to leave permanently his cradle, does Mars necessarily represent the best of the destinations ? Suppose SpaceX succeeds in sending dozens of men to Mars in the not-too-distant future. 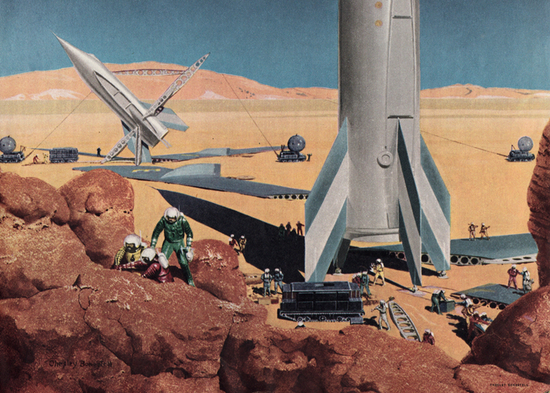 The very first issue of Martian colonization is transportation. 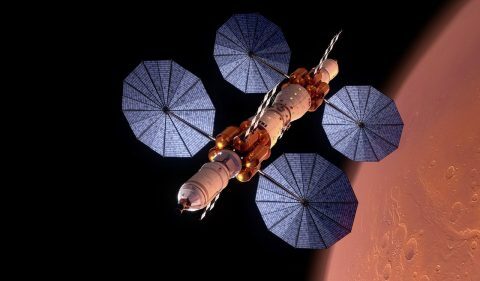 The US company’s solution is based on very large reusable spaceships, the BFRs, which would make the trip to the red planet in large number at each firing window, approximately every two years. These spaceships would work without the need for technological breakthroughs : the BFR is a reusable rocket with chemical propulsion, which is a little closer to the vision of Wernher von Braun. SpaceX’s mission program makes some choices to make the journey possible, including local fuel production. This detail makes the SpaceX project very different from what the Apollo missions or most Martian exploration projects may have been. The Martian colonization is not only an option allowed by the trip, it becomes necessary to it. Without the deployment of local production infrastructure, no return possible on Earth. But there is a problem : if we go to Mars to establish a colony and establish a colony to make sure we can go back, what concrete benefits would there be for humanity to go to establish on another planet, and why Mars in particular ? Elon Musk, the founder of SpaceX, seems primarily concerned with safeguarding the human species, ensuring that humanity thrives on at least two planets. It is a kind of guarantee against the risk of extinction : if one of these two planets undergoes a major disaster, the other can survive. 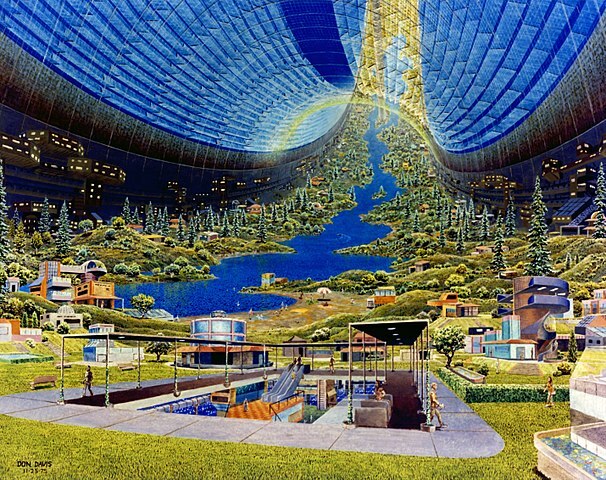 But an economic opportunity is needed for the colonization of Mars to be more than a fantasy. On this side, if we look at the geography of the solar system, Mars may have arguments for a manufacturer of the future in search of valuable raw materials. The main asteroid belt is very interesting : it houses a lot of metals and precious materials easily accessible. Mars is exactly between the asteroid belt and the Earth. A little like the cities that developed along the railroad tracks, Mars could become a must step between Earth and their new El Dorado. Thanks to its low gravity, it could for example serve as a starting point for men or robots left to exploit the asteroid belt. These are obviously very long-term prospects. If SpaceX manages to achieve its ambitions, its first passengers will have much more immediate concerns. Like all objects in the solar system outside the Earth, Mars is atrociously hostile to human life. Its average temperature hovers around -60 degrees Celsius and its low atmospheric pressure prohibits life outside a controlled environment. This atmosphere is so concentrated in CO2 that breathing it would poison a human, and even plants. Mars does not have a magnetosphere, so huge amounts of radiation fall on its surface. And we have absolutely no idea what its low gravity would cause in the long run on human organisms. If you want to go to Mars, here’s some good news : a Martian day lasts exactly 24 hours, 39 minutes and 35 seconds. Your sleep cycle should not be too disturbed. There is water on Mars, as well as all the chemical elements necessary for life. We can also think that Mars has welcomed life in the distant past. And a weak atmosphere and gravity stays better than no atmosphere and no gravity at all. We still do not know much about SpaceX’s colonization plans. The company is planning a first robotic flight in 2022 and a first manned flight in 2024, but the deadlines announced by Elon Musk are rarely respected. The goal of robotic flight is to ensure that local propellant production is possible. We should have an early response with NASA’s March 2020 rover that embeds an experiment called the Mars Oxygen In-Situ Resource Utilization Experiment (Moxie). This experiment has to produce oxygen from the Martian atmosphere. SpaceX relies on the red planet’s water and carbon dioxide resources to produce oxygen and methane, thanks to a skilful mix of electrolysis and Sabatier reaction. To make this possible, it takes a lot of energy, which is another problem. Mars is far enough from the sun to bring down the yields of solar panels. It is also regularly covered by huge dust storms that do not improve the situation. Ideally, nuclear energy would provide the best alternative, but SpaceX’s preference for already proven solutions is well known. But to produce and store the thousands of tons of propellant needed for the return trip, it would be necessary to install a large number of solar panels. It is also necessary to feed the survival systems of the passengers of the mission. Whether the first Martian settlers come to Mars from a SpaceX spacecraft or from another company, local energy production is one of the biggest problems. The environment of Mars is hostile but still offers some opportunities. For example, the problem of radiation could be solved quite simply by going under the surface of Mars. For that, there is no need for expensive drilling : the volcanism of the red planet has already done the work. It is believed that Mars hosts lava tubes, large underground and hollow corridors formed by lava flows due to the low gravity of the planet. These lava pipes could be much larger than those found on the Earth, which would allow to install vast habitats sheltered from radiation and micro-meteorites. The temperature would be easier to control. For the purpose of colonization, the local production of a maximum of elements should be allowed : propellants, but also food for example, and why not building materials. Producing food on Mars is not easy : we need to fertilize the toxic soil of the planet and grow seeds and plants in a controlled atmosphere, and with a sufficient supply of light. Mars, however, could be a little more fertile than we think : an experiment conducted by the German Space Center found that lichen collected in Antarctica was able to survive in a Martian environment. 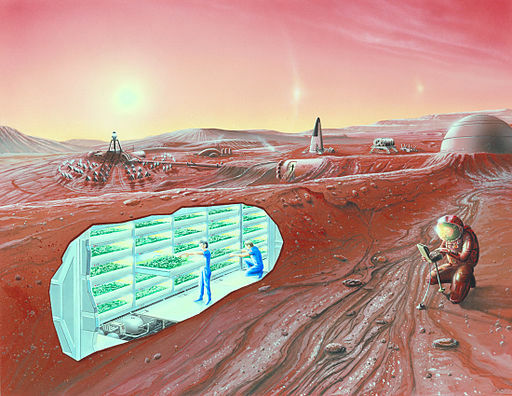 If Martian settlers manage to ensure their survival in a sustainable way, and even to take a certain independence from the Earth, they will then be able to set up a productive economy. But the initial investment to arrive at this result seems gigantic compared to the possible return on investment. It’s a project that would take generations to become profitable, which is not the kind of perspective that private companies like. One way to facilitate this could be to partially terra-shape the planet, ie not to make it completely identical to the Earth but to modify some of its specific parameters such as the absence of a magnetic field. In February 2017, Jim Green, scientist at NASA, devised a concept : a very powerful magnetic device installed at the L1 Lagrange point of the Sun-Mars system would include Mars in its magnetosphere. Thus protected from the solar wind, the atmosphere of Mars would thicken and its temperature would rise, perhaps even to make possible the liquid water on the surface. What is certain is that the red planet will continue to make us dream for a long time. It is very difficult to predict what future humanity will grant to Mars : between private initiatives on the one hand and the changing plans of space agencies on the other, it seems impossible to know who will put the foot first on the red planet and especially when. What is certain is that the Martian colonization will represent a major turning point in the history of humanity.